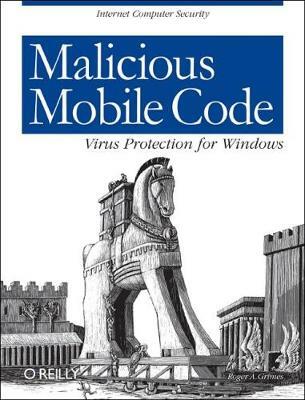 Malicious mobile code is a new term to describe all sorts of bad programs: viruses, worms, Trojans, and rogue Internet content. Until fairly recently, experts worried mostly about computer viruses that spread only through executable files, not data files, and certainly not through email exchange. The Melissa virus and the Love Bug have proved the experts wrong, attacking Windows computers when recipients do nothing more than open an email. Today, writing programs is easier than ever, and so is writing malicious code that will do destructive things. The idea that someone could write malicious code and spread it to 60 million computers in a matter of hours is no longer a fantasy. There are effective ways to thwart Windows malicious code attacks, and Roger Grimes maps them out in this book. His opening chapter on the history of malicious code and the multi-million dollar anti-virus industry sets the stage for a rundown on today's viruses and how to protect a system from them. He looks at ways to configure Windows for maximum protection, what a DOS virus can and cannot do, what today's biggest threats are and other important information. The book offers the strategies, tips, and tricks to secure a system against attack. It covers: the current state of the malicious code writing and cracker community in 2001; how malicious code works, what types there are, and what it can and cannot do; common anti-virus defenses, including anti-virus software; how malicious code affects the various Windows operating systems, and how to recognize, remove, and prevent them; macro viruses affecting MS Word, MS Excel, and VBScript; Java applets and ActiveX controls; enterprise-wide malicious code protection; hoaxes; and the future of computer malicious mobile code and how to combat it.